Here is our wonderful April/May volunteer team with its many different skills. Phillip on the left from Germany, Evan our permaculture wizard from Australia, Ella from Croatia making the new critter control liquids from garlic, ginger and chilis, Margret, Jiwa Damai caretaker, Regina, our Hungarian recipe collector of indigenous local foods and Norbee, our website and video producer from Romania. This is our storage shed for the gardening equipment. 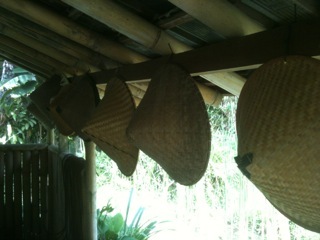 The hats are needed to protect form the strong sun as well as from the heavy rains. They are made out of Bamboo and they keep our staff nice and cool and protected. 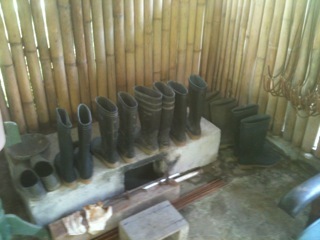 The boots are for working in the river or in the mud. A wonderful volunteer group with incredible supportive skills. Evan from Australia, giving much love and knowledge to our garden, Iseult from France, supporting with her graphic skills improvement on the website, Lulu from Brazil, introduces many wonderful recipes how to prepare cassava from her Brazilian cooking heritage. Our Chilean fairy, filming and producing four wonderful videos, last not least Boris from Bulgaria, working though our website and company structure. A great group. If you would like to join us as a volunteer, find out more. What a surprise! On Indonesian National Independence Day, Margret found this motorcycle gang parked in the Jiwa Damai parking lot: a huge number of heavy motorcycles with the accompanying drivers as well. Rasio Bali group which is connected all over the island. Wondering why they were parked here, we tried to find out their purpose as well. After much back and forth talk, they were willing to offer support if needed for our educational and social foundation, Lagu Damai. They stressed that they support good causes and if we let them know they will support ours and we can also support theirs. Lukas and Analee are leaving and they gifted us with the most wonderful divine chocolate mousse cake for their goodbye celebration. This was their last evening Jiwa Damai. We are so grateful for their presence and wish them all the best in their new life. They will get married in the USA. We wish them lots of love! Arabella was our volunteer from Amsterdam. She stayed at Jiwa Damai for 5 weeks and shared with us her enthusiasm and positive energy. After her program was over we wanted to share with you her story because we found it genuinely inspiring. „Previously, I worked as a project manager and marketing consultant at an advertising agency in Amsterdam. But I had a wake up call after travelling the world and hiking the Camino de Santiago in Spain, I shifted my career with a focus on sustainability and circular economy, and started working at Blue City in Rotterdam. 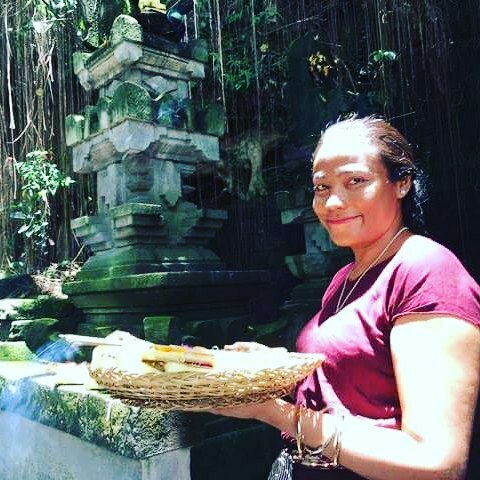 One of the reasons I do wwoofing and came to Jiwa Damai in Bali, is to learn from nature and reconnect. And also work with the context and come up with possible solutions within that context. During the 5 weeks I worked on several projects; restarting the mushroom project, shaping the compost areas, seeding and transplantation, organizing the seedbank and planning a family veg garden as an empowerment project with the purpose of making them less dependant on external sources. My time at Jiwa Damai was wonderful and so much more then just a wwoof experience. It was a gift that kept on giving. The place is magical with endless (sometimes hidden) learning opportunities and the possibillity for cultural exchange.” Arabella, our volunteer from Netherlands. When I initially agreed on a work-trade exchange with Jiwa Damai, I knew I would be in for an experience of personal growth, learning new skills and refining others, healing wounds, and making positive relationships. What I had yet to know was how the life-giving and infinitely deep energy of Jiwa Damai would work its way into every fabric, mental frame, and atom of my being. Sure, I had indeed supposed the concepts of these things – like the personal growth, healing wounds, etc. that I mentioned – yet, to be living and working here and feeling these things as alive, vitalized truths is something one cannot simply “know” or “understand” …it has to be lived. “Ah…yes,” I thought to myself when I first started waking up to what is Jiwa Damai’s life-giving energy working its way into me, “this sounds familiar.” Collectively, we have heard these same constructs before, such as - the meaning of life cannot be merely named, or understood, it has to be lived; theory is only 10% of learning while experience is the other 90%. “I have found real life! I have found real life! Life is expressing through me!” I exclaimed to myself when my first epiphany at Jiwa Damai occurred. Simply, what I am speaking to can be accessed because everyone and everything already is. The beauty of the process of connecting back to this truth here at Jiwa Damai is that Margret doesn’t bludgeon you over the head and tell you to “wake up, pay attention, or remember”’ in order to experience this life-giving energy. The collaborative energy of Margret and the Earth here move in such a way that Jiwa Damai already, definitely is without you having to do a single thing to it. It’s like a 5-star luxury retreat resort where everything is already taken care of for you, and every whim, want, and need of yours will be immediately granted. Then, as soon as you can release your grip to drop your baggage, relax, and open into what services Jiwa Damai has to offer that you, you will then begin your unforetold and insufficiently anticipated process of immaculate, energy healing. The magic of Jiwa Damai is also that regardless of your recognition or not, it will still indeed be able to work its way into you subconsciously on cellular and multi-dimensional levels, so that no matter what, you will leave here better off than what you were when you first came in. Even though, as I just mentioned, the special life-force of Jiwa Damai works in unconscious ways, I still relish all the opportunities I can get to interact with Margret so that I may consciously connect to this pristine, powerful energy vortex that she has cultivated throughout this space. Whether through our conversations at meal times, working on projects together, attending her nightly Heart-Self meditations, or just randomly seeing her about, learning from Margret is one of the greatest gifts, privileges, and honors of my whole life. And I say of my whole life not only because this experience is thriving with what is life, but also because she taps into the many dimensions of life – past, present, future, personality, psyche, professional, personal, emotional, energetical, etc. – and revives the present, raw energy of what life is truly supposed to be back into my “higher, deeper, most innermost Self,” as Margret likes to say. Not forcefully, like I mentioned earlier, but softly and of my own initiative and engagement when I’m able to trust-fall back into the arms of Jiwa Damai. Beyond being a place for retreats, organic and permaculture gardening, yoga, and meditation, Margret has created a space for individuals to practice, to play, to explore, to unravel, and to go evermore, infinitely deeper within their hearts and Selves. Literally and figuratively, waking up to this sacred, unconditional source-energy of Life is my reality every day here at Jiwa Damai. And for that, I am eternally grateful. Written by Analee Scott - resident yoga teacher and volunteer at Jiwa Damai. 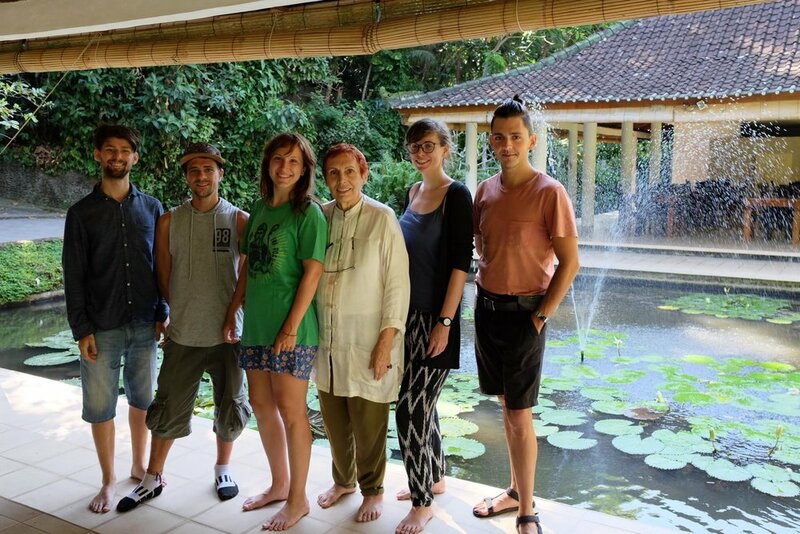 Analee was also a teacher at New Earth Nation’s Bali festival – Ancient Futures – this April. This August, Analee will be leading a Dreaming Consciousness Retreat at Jiwa Damai. "At Jiwa Damai I felt as part of the nature, not apart from nature", says Bernardo, our volunteer. Bernardo is a yoga teacher but he also had the chance to work closely on our mushroom project, taking care of them and planting them. He also worked with the coconuts and prepared the natural coconut oil. For Bernardo, Jiwa Damai was the place where he had his first woofing experience. "Jiwa Damai starts from the idea of a retreat. I felt that I could work on my emotional part, even having people around. It offered me the time to reflect on my own life. I visited Bali, I went to the south, the east, the west, but Jiwa Damai is the only place where I managed to reconnect with the Balinese nature. It is the nature that really creates the uniqueness of this place", says Bernardo. While Bernardo was a volunteer at Jiwa Damai, a yoga teacher training course was also taking place. "As a yoga teacher myself, I can see why doing the course here is more interesting. This place enhances the experience of the training. You get more connected to the environment", says Bernardo. Originally from Brazil, Bernardo has traveled before to India and Thailand. His next stop is Malaysia. We wish him all the best and we are very grateful to having him as a volunteer at Jiwa Damai. Time seems to speed up and the intensity increase. So many different activities are taking and took place at Jiwa Damai and the Lagu Damai Foundation. The garden, aside from going us our wonderful virgin coconut oil is now providing for our health the powerful Moringa leaves, dried and filled in capsules. The mushroom production is growing slowly and we held the first organic market in our village. We invited the whole village in the village meeting hall to share with us a health day, providing nourishment for body and mind in the prevention of diabetes and high blood pressure. Power point combined with healthy foods were welcome by old and young. 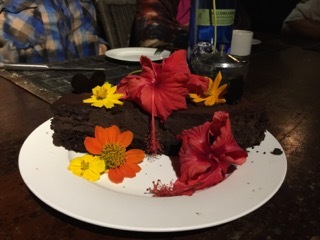 During this year, three intensive long term Yoga teacher training were hosted by our team and all organic nutrition provided from our permaculture gardens were transmuted into wonderful, much reclaimed vegetarian dishes by our cheerful kitchen fairies. A certification training (Permaculture through the Heart) was offered as well. The sacred painting class with our local priest was another means of going into a deep meditative state while working. Aside from hosting guests and retreats, the first small building will be erected at Awan Damai (peace of clouds) in the mountains at Gunung Sari. It will be simple, built partially with bottles and natural materials and provide the basis for our next adventure, the Earthship. Situated on a wonderful site, overlooking the sea from high above, sunrises from the east to the sunsets in the West. The access is only possible by motorbike. The land is of immense beauty and more land is available for sharing with like minded. Margret, our founder, a transpersonal psychologist is offering now the HeartSelf-Intelligence meditation online on our website. Please sign up to unfold the qualities of the heart and learn how to love yourself on a deep level and live well in these turbulent times.